The 2019 General Elections are almost here but, so many candidates are relatively unknown and so, YNaija is offering a free platform for young candidates not more than 35 – notwithstanding the political office. 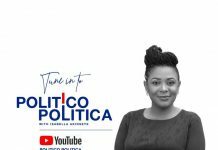 The YNaija series titled YNaija Politico is a platform where young candidates running for various offices for 2019 can talk about their aspirations and how they hope to achieve whatever they have outlined to the people they hope to lead. It is, indeed, an opportunity to reach a wider audience. 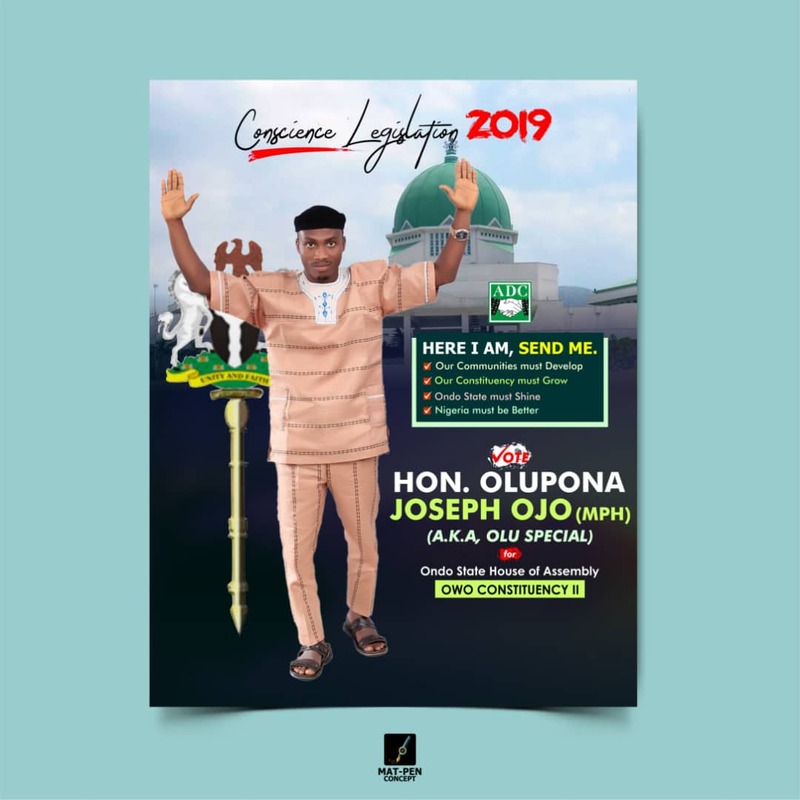 I am Joseph Ojo Olupona, popularly known as Olu Special. The President of Conscience Group Nigeria, a preacher of conscience and moral values, also an advocate of community development. 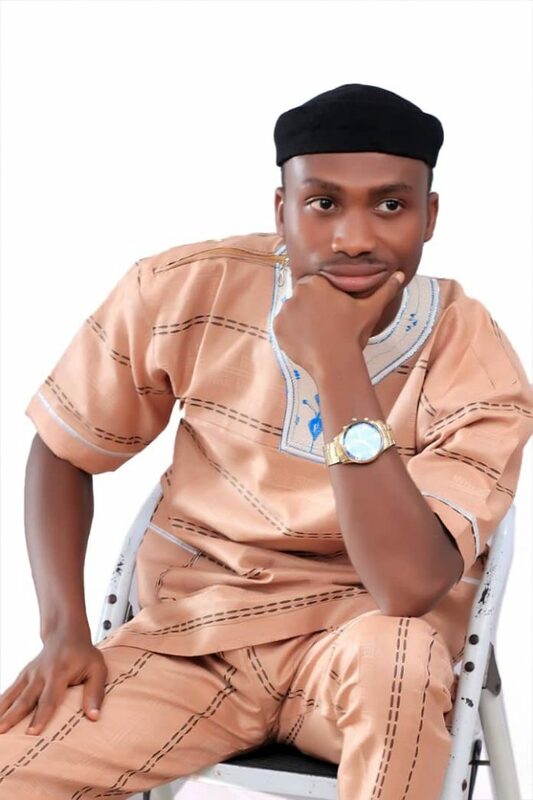 Born in Ipele, in Owo Local Government Area, Ondo. I studied Environmental Biology and have a Master’s Degree in Public Health (Environmental Health) University of Ibadan. I work professionally as an occupational farmer, cultivating plantain. My political sojourn started from my university days as class governor; then I became a member of the Science Students Representative Council (SSRC); President, National Association of Science Students (NASS) – 2011/2012 academic session; President, National Association of Ipele Students ( NAIS) – 2012/2013. My quest for community development and emancipation made me join partisan politics in my ward. I continued as a grassroot mobilizer in 1999, 2006 under Alliance for Democracy and Labour party. Fast forward to 2016, I was the Ward Secretary of Alliance for Democracy during the Ondo gubernatorial election. Now in 2018, I am contesting for House of Assembly seat – Owo constituency 2 under the platform of African Democratic Congress (ADC). I decided to run for the House of Assembly seat not because I want to be popular as many may think, or because of the Not Too Young to Rule Bill, though it favoured me to contest but, I am in the race because I see myself winning. I have long prepared for opportunities like this. I am in the race because I am capable of bringing quality service and delivery to my people in the area of education, sustainable agriculture, environmental health, youth and women empowerment program and community development programs. Asides my primary legislative assignment which is to sponsor bills (and make laws), I will ensure more people lead better lives. My constituency is a conglomeration of rural and semi urban communities. Yet, most children trek long distances to acquire basic education, the road network to farm settlements is something to be concerned about, sanitation and access to clean water is a problem, our youth and women live in abject poverty because of unemployment, security is basically absent. These identified challenges will be given top priority them if I am elected. This is how I will do it. I will turn my constituency to an agricultural and cultural hub through waste to wealth initiatives; ensure value chain to our agricultural produce; improve opportunities for small medium enterprises, encourage growing of trees in each ward for future exploitation and exportation, and build milling industries in each of the ward. If I emerge, there will be more town hall meetings to meet opinion leaders, youth women clubs and association leaders to discuss the plights of the community. Also, parliamentary proceedings to keep them abreast of happenings in the state assembly. In my bid to win the coming election, I have moved around the ward and hosted meetings with stakeholders and constituents. We find the road to achieve this challenging because the electorates regard all politicians as liars and are tired of failed promises so, they instead prefer to collect money from candidates believing that that’s their own national cake – a disaster to nation building. However, I wake up each day with stronger faith. My constituency will not regret to have me as their Representative after the election in March 2, 2019, due to my distinct and fresh ideas that would be used to harmonize potentials and bring development to the constituency as a farmer, public health expert and young astute politician. 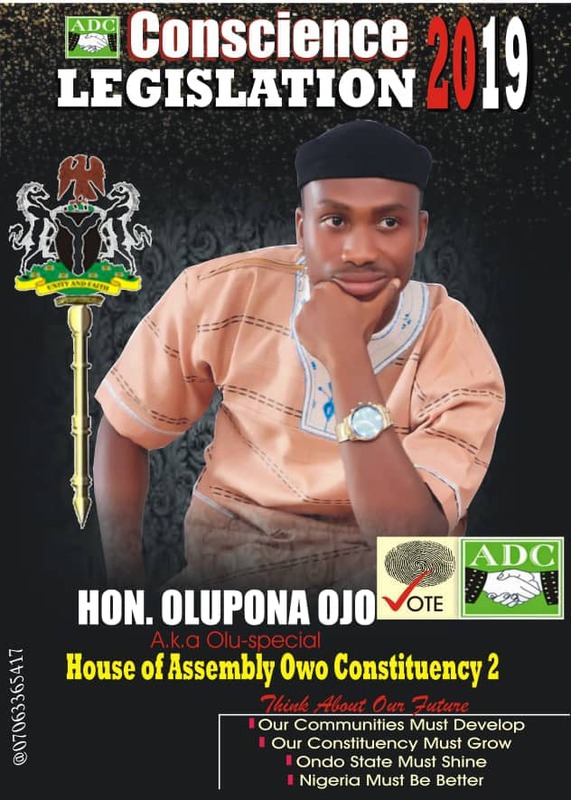 Once again, I am Joseph Ojo Olupona, a candidate, House of Assembly, Owo constituency 2, running under the banner of African Democratic Congress (ADC). What a great manifesto and idea! I hope electorates would key into these agendas and support you at the balot come 2019. Oluspecial we set your back o, na you go spank the election o, greater you bro. Nice write up brother, God strengthen you and greater heights IJN.